Hiking at night in the cold desert air, I crossed nearly 3 miles across shifting sand dunes to reach Deadvlei. 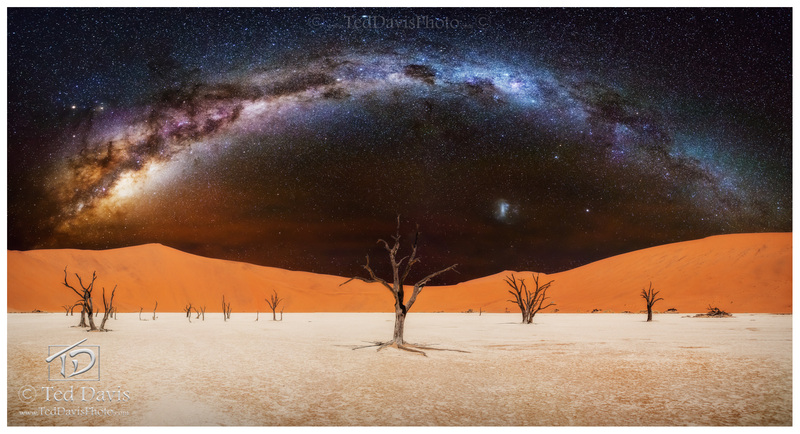 I had a vision in my mind, to capture the Milky Way above the ancient husks of the Acacia trees in the salt pan of Deadvlei. Traversing the sand dunes on foot, through coyote and cheetah hunting grounds, I was part terrified and part thrilled at finally attempting a shot I had been imagining for years. Arriving in the salt pan, I spent hours framing different tress, taking long exposure panoramics and patiently waiting for the light cloud cover to clear and for the stars to align. I spent the night in the salt pan, determined to capture the absolutely perfect shot. Finally, I had my images – a set of panoramic images of the salt pan and a combination of images capturing the beauty of the Stars, Radiant in the Sky. Photo © copyright by Ted Davis.